Mules are equine animals like horses, so caring for them is almost the same as caring for horses. However, mules are often smaller and require less food than horses. The basics of mule care extend from feeding and grooming to exercise and health care. Before planning a routine for your mules, consult an equine veterinarian and consider weight, age, climate and other factors. Mules need a roofed, dry area to sleep and to rest in. An outdoor pen or corral is not enough; a barn or stable is required to properly house mules. Be sure the confinement area is secure so the mule cannot escape. For multiple mules, divide the space into stalls to keep mules separated. Each stall should have bedding such as dry straw or wood shavings. Determine your mules' individual weights, then feed or graze them to maintain a healthy weight. Consult a veterinarian to determine an exact feeding recommendation if you are unsure. Generally, mules can graze all day on hay or grains, and they can eat anything horses can eat. You can provide treats such as apples, carrots and other fruits or vegetables. Fresh water should always be available. Do not allow mules to go longer than 8 hours without food. Brush your mules to maintain optimal hair and skin health. If your mules get a lot of exercise, get very dirty or muddy, or endure high temperatures for extended periods of time and sweats, they'll need baths. Give baths with just water or with horse shampoo. Like horses, mules used for work or recreation need horseshoes and require hoof maintenance. Consult with a farrier, a specialist who applies horseshoes and cares for hooves. Daily exercise is important for mules to maintain good health and an ideal weight. 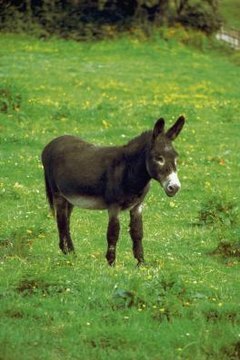 If your mules are not being used for work or recreational riding, at least provide a large fenced area for them to walk and run about in. Daily removal of manure and rinsing of the stalls is imperative to having healthy and happy mules. Scoop up and dispose of manure with a shovel or scraper, and rinse and wash stalls with a hose or pressure washer as needed. Failing to keep a clean area can result in health problems and sickness in mules. In addition to basic grooming and hoof care, you'll need to address other health issues. Take notice of your mule's eyes, mouth, skin and behavior. You may also need to use prescribed treatments for lice, worms and other parasitic infections. Yearly veterinary examinations and vaccinations should be part of your mule care routine. Park Lane Equestrian: What Kind of Food Do Horses Eat?